Wines in a box are already a great idea for many types of consumers -- ironically, usually the exact people demographically who scorn the idea. Now there's yet another piece of evidence in their favor. 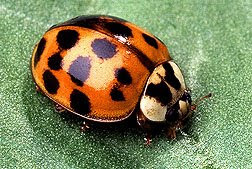 It turns out that if a winery grinds up Asian lady beetles -- accidentally, we hope -- into the wine, the results taste better out of a bag-in-box. You probably think I'm making this up, but it was in The Economist, which is about as respectable a source as one can get without a byline. I'll spare you the chemistry details. I'd rather talk about the types of people who should be drinking their beetles 'n wine from a box. If you buy one type of inexpensive wine by the case, and are happy drinking the same brand every day for a week, you ought to be buying wine in a box. It's cheaper and it lasts far better once it's open. If you only want one or two glasses of wine per night, but you drink every night, you ought to consider wine in a box. That said, both of those groups of consumers tend to be over 40 -- the exact consumer group that, in the US, is most resistant to wine in a box as somehow not as romantic as a bottle with a cork closure. They'll never be as delicious as green-bottomed ants, though. But that's a topic for another day. Why is anyone still using plastic corks?